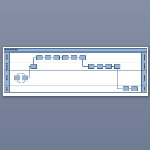 If you work with Microsoft SQL Server and are a visual type, then you might be interested in these free Microsoft Visio stencils for SQL Server 2005. The set contains 6 stencils, 6 templates, 102 master shapes and 34 sample drawings. You can preview the look and feel of the shapes and sample drawings in this article, then go off and download them for your own person use! I’m sure you all have iPhones that automatically synchronize your calendars with Outlook and with that chip you had embedded in your brain. But sometimes it’s nice to get an overview of the entire year at once. And sometimes you want to print it out and mark it up.